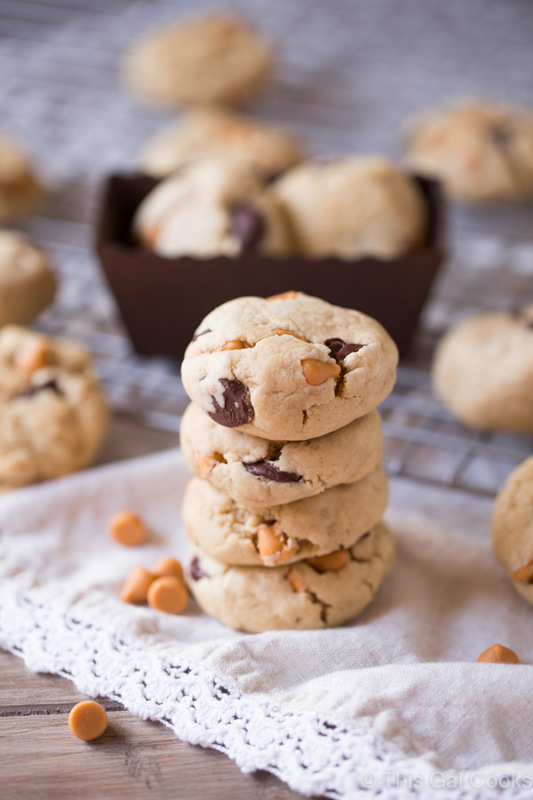 These Soft Butterscotch Chocolate Chips Cookies are made soft by using cream cheese in the batter. These cookies won’t dry out at all. You’ll keep coming back for more! Did you have a good weekend? I sure did. I shopped till I dropped at the grocery store, which is nothing new. I love shopping for groceries and I’ve been known to frequent grocery stores multiple times per week. True story – I wander the grocery store, visiting many isles more than once. Sometimes it’s to make sure I have everything on my list. Sometimes it’s because it helps me come up with recipe ideas. Either way, I have fun doing it and it’s my most favorite type of shopping ever. So, on to that big announcement. I’m launching a new blog within the next few weeks. My fellow bloggers will call me crazy. Maybe I am. BUT, I’ve been considering launching another blog for almost a year. So what’s this new blog going to be about? Healthy recipes. I’ll also share a little about my quest to stick to a consistent workout routine. I know I’ve shared healthy recipes on this blog, but I want to totally focus on healthy recipes so I can be consistent. I share sweets and calorie loaded foods on this blog so it kind of negates the healthy recipes I do share. Don’t worry. I’ll still be managing This Gal Cooks. I’ll still share new recipes. It may not be as frequent during the week but all of my calorie filled comfort foods and desserts will have their place on This Gal Cooks. I’ve already created five recipes for the new healthy recipes blog. If you follow along on Instagram, you got a sneak peek into those recipes this weekend. I’m finishing up the finishing touches on the new site and once I get the first post, I’ll be sure to let all of you know! UPDATE – I decided to NOT start the other blog. I’d probably go insane if I did! So onto these cookies. Have you ever made cookies with cream cheese? I got the idea from one of my favorite bloggers, Averie from Averie Cooks. The cream cheese makes the cookies soft, puffy and it prevents the cookies from drying out. A couple months ago, I made these Pumpkin Cinnamon Chip Cream Cheese Cookies. They were a huge hit with everyone. The cookies I’m sharing with you today were a huge hit, too! Enjoy the recipe! 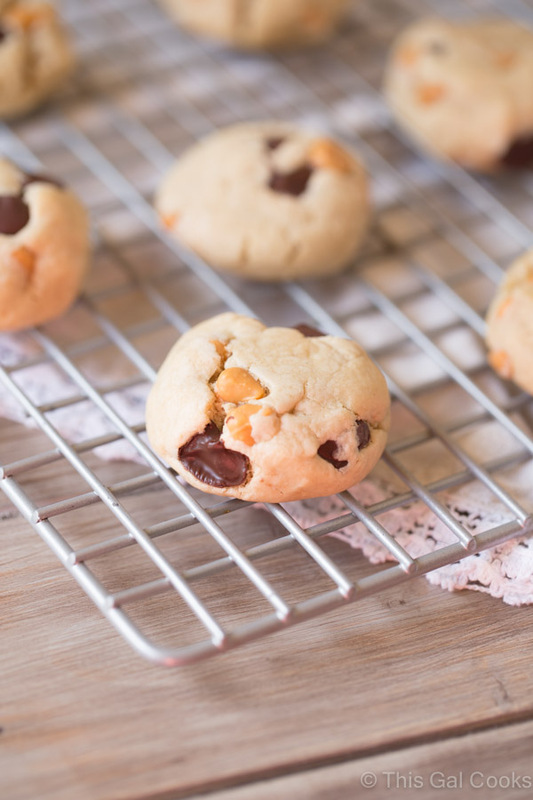 Soft, puffy cookies are filled with butterscotch and semi-sweet chocolate chips. Made with cream cheese, the cookies will stay soft! ¼ C Philadelphia cream cheese. Low fat is ok.
Preheat your oven to 350 degrees. Line 2 baking sheets with parchment paper. In a mixing bowl, whisk together the flour, corn starch, baking soda and salt. In the bowl of a stand mixer, using the flat attachment beat together the butter, cream cheese, sugars, egg and vanilla extract on high speed for 5 minutes. Add the flour mixture and beat on low until well incorporated. Mix in the butterscotch and bittersweet chips. Place 1¼ tbsp balls of dough onto one of the baking sheets, 2 inches apart. Bake for 8 to 10 minutes. While the first batch is baking, place balls of dough onto the second baking sheet. Repeat process until add dough is used and baked. Allow to cool on a wire rack for 10-15 minutes before serving. Be sure to refrigerate the dough before rolling into dough balls. This will prevent the dough from spreading while baking and it will keep the cookies thick. I use a 1¼ tbsp cookie scoop to scoop the cookie dough and then form into balls. Recipe adapted from Averie Cooks. I absolutely love the idea of adding cream cheese to cookie dough! I’ll bet it makes them just melt-in-your-mouth amazing! Speaking of which, I need these gorgeous cookies in my life pronto! Thanks so much for stopping by. Hope you enjoy the cookies if you give them a try. Thanks, Emily! The butterscotch and chocolate combo is so so good! Congrats on the new blog! I can’t wait to read it! In the meantime, I will enjoy a few of these cookies! That’s amazing news, Julie … can’t wait for the new blog! In the meantime, these calorie-filled cookies are perfect for Christmas. No, I’ve never tried adding cream cheese to cookies before. I’ve tried ricotta in muffins which was really good, so I’m sure this would be a great addition to cookies, too! Merry Christmas! 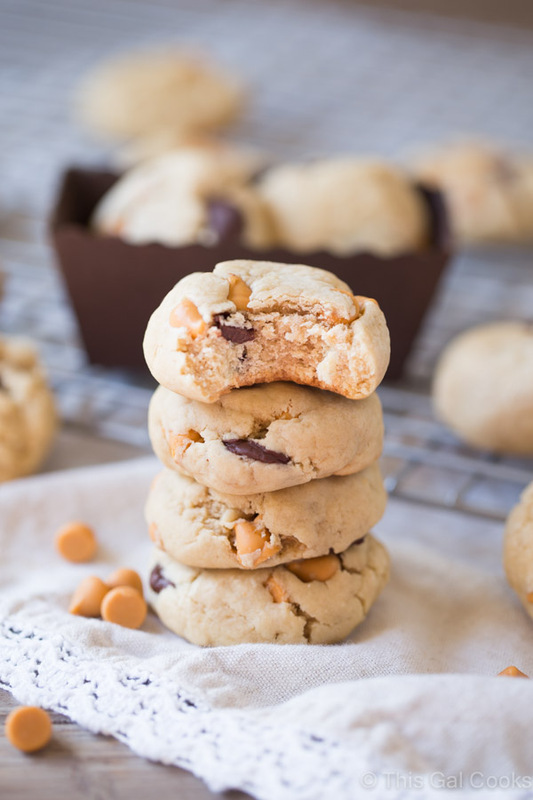 I LOVE anything with butterscotch, so i know that I would love the taste of these cookies! Definitely craving a couple to devour right now! I’m excited for the new blog!! I can’t wait to read it! Hi Michelle! This recipe works great. I’ve made two varieties using this method and both turned out great. Hope it works good for you, too!